The omnipresent (from New Zealand to Vancouver) “secret dinner” (Supper Clubs) trend has reached Berlin, resulting in series of blogger or journalist reports, even in the newspapers and on TV. Well, it has been around for a while, although, surprisingly, there are not many volunteers as yet, definitely it is far from the scales it reached in e.g. London (something like 25 guerilla kitchens). The key to success is to create “exclusivity” by writing on a blog page ” next dinner booked out” (except for offering excellent cooking). The most established company, “The Shy Chef”, regularly appearing in the media, revealed a rather international background, as in the cooks team, as on the guests list. Unfortunately, the original team (who brought actually the fame to this brand name) seem to have left/moved out, passing the idea over to a follower, who is not necessarily same creative or offering same quality. The dining in “someone’s living room” turned out to be a rather rustic kitchen table set up in a wonderful, although only rented for the evening, location in the posh area in Kreutzberg (said to be regularly rented to international film stars and crews working in Babelsberg). Guests from Australia, USA, Prague and Berlin (including Italian and Russian) mixed up nicely, generating great feeling; the service capacity was a bit underrated- too many guests for one host aid (The “shy Chef” himself was hiding in the kitchen most of time and appeared during dessert). Food was indeed paired with wines(as claimed), although the menu choice and the long pauses between servings left the guests questioning. Nevertheless it was a nice evening; just too long (up to 1am! ), also slightly overpriced. A newcomer in this field- “Fisk & Gröönsaken” (sounds a bit like Danish- means, in fact, “Fish and Vegetables” in northern German dialect) has started with a more modest size of the table, and a very fancy menu. Our supper (more compact, in number of servings and total dining times) featured, for example, finest semi-rare tuna with raspberry tempura and wasabi foam (their gastronomic focus -fish and vegetables). Wines did fit nicely, too. And it was a real home of real (no profi culinars background) Berliners. 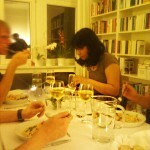 -very good listing of Underground supper club scene and very updated! 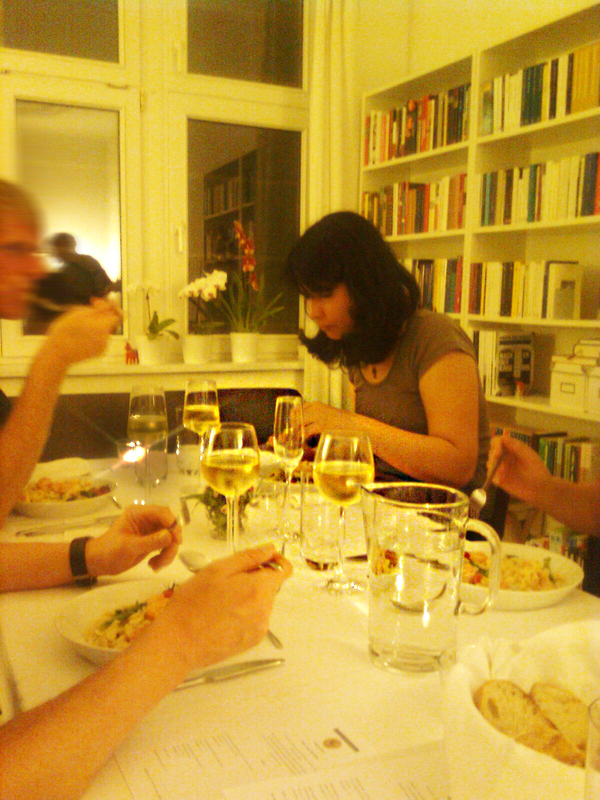 I’ve just opened a supper club in Berlin as well – first official dinner on September 10th. Would be great if you fancied doing a review!